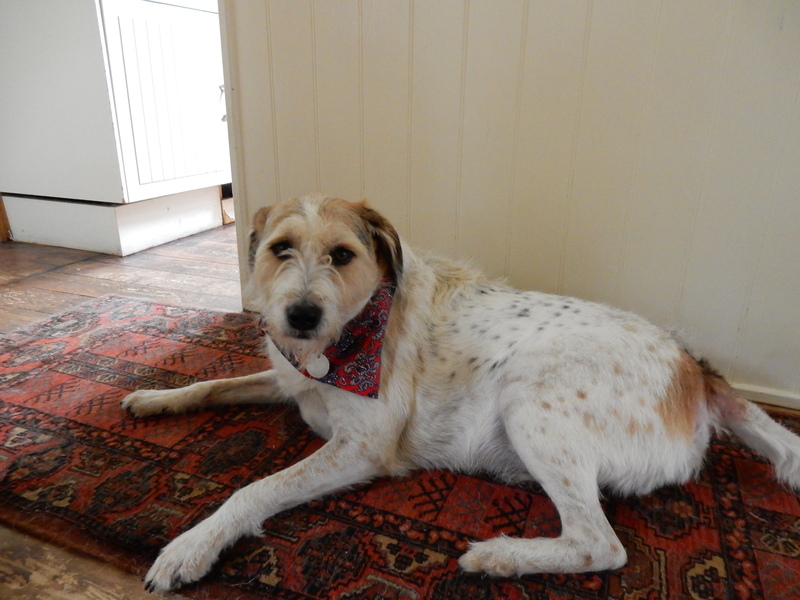 Friday- and Ted, who is now sporting a natty bandana in my futile attempt to make him look friendlier- goes ballistic at the front door thereby announcing that a nice parcel has arrived. I know what’s in it-bulbs! But Friday is also my teaching day , so only time to open the box and lay the packets out on the table in date order. As planned when I poured over the Parkers catalogue a few weeks ago, with this little lot I could ensure a good six months of flowers from January to July- here lined up in flowering order- biggest, July down to smallest in January. I always buy too many and then feel overwhelmed about the idea of planting them- some years the nets of bulbs have been lingering shrivelled and unplanted in February- so have resolved to be more restrained on quantities this year. I’ve given up on lilies as they get eaten every year by the red peril ( as I call the dreaded lily beetle). Clever little minxes they are too- being a scarlet red colour they’re easy to spot. But as you go to pick them off, they sense the vibration and deliberately throw themselves off the plant backwards like an insectivorous Tom Daly, landing on their backs with the tell-tale scarlet colour now hidden making them impossible to find and squash. So instead, for July, I’m going to try this Allium, Allium giganteum , which the catalogue assures me is the last to flower, covering the gap left by lilies- can’t wait. The class arrive and pour over my bulbs and there’s lots of chat about where to get them from and who’s got what, and then ‘name and shame’ which I love as it appeals to the cruel streak in me. “ Who , last year, ended up with some bulbs unplanted by Spring? Come on, own up!” A couple of hesitant hands are raised and there are murmers of disapproval from the saintly rest of them. I should have raised my own hand – but teachers are above such confessions. We then do a critique of Ludlow’s Open Gardens. Angie has taken some photos and we use them to suggest improvements. I mean, if you had a view of Ludlow Castle like this why would you demean it by putting up a suburban fence like this? Surely a stone wall or, at the very least, a yew hedge! But chose to completely reinvent himself, morphing into the very posh voiced former director of the V and A, best known for his ground breaking exhibition ‘The Destruction of The Country House’ which called attention to the scores of beautiful and often historic country houses being pulled down in the name of progress and modernity. The class all agree that Sir Roy does seem to be rather self absorbed as evidenced by owning a garden that is choc full of named areas and memorabilia commemorating their lives and careers such as- The Cecil Beaton sundial, Di Fledermaus Walk etc. However a solution has been found. Perennial is the garden charity that looks after old or struggling professional gardeners and it also has care of another garden, the great York Gate in Adel, Leeds which is among my Garden Top 10.